One thing every serious athlete looks for is an edge over their competition. Whether it be a high school wrestler looking to win a state championship, a triathlete training for a race, or a professional football player looking to dominate the league and set records, they’re all looking for that little something that gives them a leg up. Currently, the best example of this is the lengths that Tom Brady goes to micromanage his lifestyle to battle father time. We can all buy in to the fact that training matters…that diet matters…that sleep matters…And there’s been a recent push in most sports to understand that recovery matters. In fact, it matters big time. But that wasn’t always the case. Most of the time, we go through transition periods where people poo-poo new stuff and consider it pseudoscience. If I’m being completely honest, IMO, some of the TB12 stuff seems to be just that on the surface. But I always keep in mind that, 5 years ago, most people were saying the same thing about yoga…or meditation. So I like to keep an open mind, as should you. Whether you’re a sports coach or an athlete, there may be something on the horizon that may be bigger than anything that’s come along in quite some time. Something so big that the scientists who discovered the molecular mechanisms behind it just won the Nobel Prize in Physiology/Medicine in 2017. I’m talking about circadian rhythms. 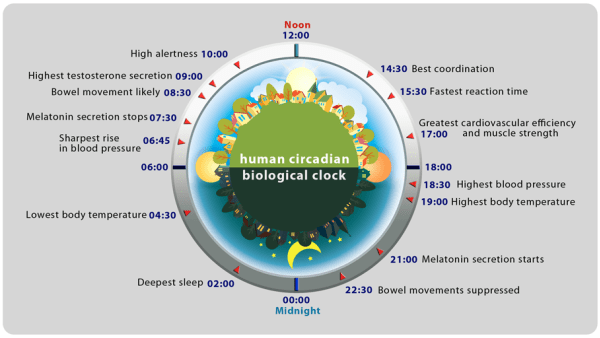 Circadian rhythms are biological processes that follow an innate 24 hour cycle, even in the absence of the day/night cycle. Circadian rhythms appear to be present in all forms of complex life and quite a few single celled organisms as well. Circadian rhythms tell plants when to turn up their leaves to reach towards the sunlight, and they help animals anticipate food and optimize their ability to find and kill it. How does all of this relate to athletic performance? Circadian rhythms regulate everything from your arousal state, your ability to recruit muscle, your endurance, your sleep, and every aspect of your recovery. And we’re not just talking about recovery from training, we’re also talking about recovery from concussion, injury and illness as well. In a basic sense, circadian rhythms help align motivation and performance to increase your likelihood of finding food. We’re not that far removed from a time where it wasn’t as simple as calling Pizza Hut to meet your calorie needs, and during this time performance dictated survival rather than your ability to juke a lineman to strip-sack an opposing quarterback. Optimizing your focus, force production, and decision-making just so happens to be as important for sport performance as it is for finding food. Additionally, circadian rhythms help form a firewall to separate go time from down time, use from repair. Having these things separated is important because they’re designed to be dealt with in that way, so optimal performance is dependent on that concept. This basic concept makes sense; would you try to change the oil in your car while driving it to work? I think not. There really isn’t an attribute of optimal athletic performance inside or outside of all sports that isn’t in some way affected by circadian rhythms. Recovery dictates how much you can train and practice over the year or limit your games missed due to injury. As you can see, dialing in circadian rhythms has the potential to be one of those things that can give an athlete a huge edge over the competition, especially since no one’s paying any attention to this stuff. But it’s important to know what to expect from manipulating circadian rhythms, as things like this often over-promise and under-perform. It’s a tad ridiculous, but I would be remiss if i didn’t throw down the standard disclaimer here: There’s little chance that tweaking this stuff will make you the next Tom Brady or Michael Jordan. 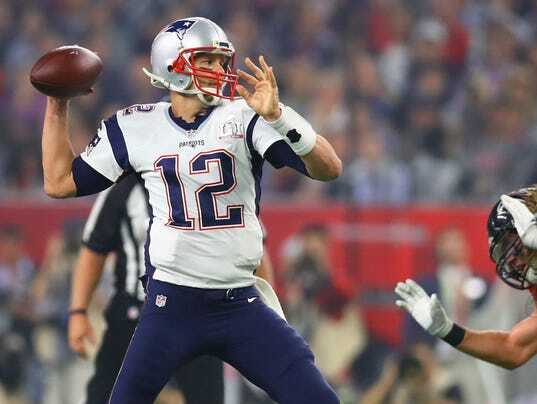 If you are Tom Brady or Michael Jordan, it will allow you to be a better version of you. It’ll help you optimize training, reduce your risk of illness and injury, and help you better prepare for competition. If you’re Stan who can run an 8 minute mile…well…you’ll never become Michael, you’ll always be Stan. The ideal day for anyone, whether they’re Tom, Michael or Stan, is to wake up feeling refreshed, alert, and focused for the day. This can’t be done without great sleep, and great sleep is entirely dependent on your circadian rhythms. 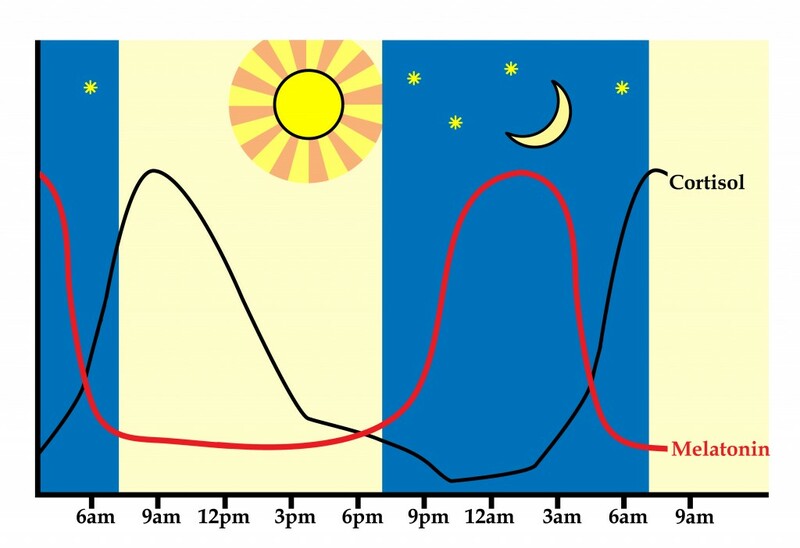 This graph illustrates the ideal circadian rhythm of cortisol and melatonin and where they fall in the day/night cycle. They have opposing effects on alertness with cortisol causing you to be awake and alert and melatonin inducing sleep. It makes sense, cortisol is high and melatonin low in the morning and the two flip flop at night. But shifting one of these curves 3 hours in any direction will put them anti-phase to one another, making your mornings groggy and your nights restless. Shifting the 2 curves together could be just as problematic because it would cause you to peak at the wrong time or to be alert when you should be winding down to go to bed. Since both cortisol and melatonin both have more than one input that also follow a circadian rhythm, both of these scenarios are possible and may even be common. In fact, it may be one of the ways sleeplessness and overtraining intersect. No matter how you cut it, that combo is terrible for performance or recovery. There’s also the issue with not producing enough of either hormone. Even if they peak and trough where they’re supposed to, if they don’t peak or trough as high as they’re supposed to you can run in to trouble. Remember, cortisol promotes alertness and mobilizes energy while melatonin helps induce sleep. Melatonin also appears to function as a fat and water soluble antioxidant and helps regulate glutathione, your master antioxidant. Circadian rhythms also play a role in optimizing nutrition. Stomach acid, intestinal enzyme secretion, bile output and GI motility all follow a circadian rhythm and are crucial to digesting and absorbing the nutrients in your food. Even melatonin jumps in on the act, inhibiting insulin secretion at night, possibly to prevent a precipitous drop in blood glucose while you are asleep and fasting. And then there’s the immune system: sentinel to exercise recovery, injury prevention and recovery, and resistance to infection. Inflammation is greater at certain parts of the day, your risk for viral infection follows a circadian rhythm, and when you have surgery to repair your ACL tear seems to dictate how quickly and effectively you’ll recover from it because the cells that heal the wound also follow a circadian rhythm. That brings us to sleep which, if sufficient in quality and quantity, should bring you back to your refreshed, alert, and focused morning. High quality sleep of sufficient quantity is dictated by that same cortisol/melatonin curve above. This reinforces alert and focused morning Stan, which underscores the synergy that can be gained when you try to lock in your circadian rhythms. Alert and focused Stan optimizes practice, competition, and recovery from both. He also gets all the chicks…ok, maybe not. Knowing your type is the first step in figuring out how to use circadian rhythms to your advantage. Most people(~70%) are neither types which means they fall somewhere in the middle. But no matter which type you are, your type isn’t strictly determined by your genetics, it’s a function of your genetics and environment. This means you can tweak it, and potentially improve your performance by doing so. Now, it’s important to point out that there isn’t a single circadian clock. While there’s a master clock that helps set the basic rhythm, the master clock interacts with other peripheral clocks that appear to be present in every organ and tissue in the body. This makes sense, communication between different tissues can’t be a one way street. And while the master clock is primarily regulated by the day/night cycle, the peripheral clocks are regulated by other factors as well. The 3 main environmental factors that you can manipulate to tweak your circadian rhythms, called zeitgebers, are light exposure, the feeding/fasting cycle, and physical activity. There are others, but these are factors that athletes already manipulate for athletic performance, they just tend to focus on how much of each they’re doing and less on when they’re doing them. Ultimately, when dealing with circadian rhythms, when is the crucial variable. And if when is controlled, it can regulate how much, how often, how effective, how strong, how fast, how alert, and how resilient. Knowing the variables is the easy part. Using these variables to gain an advantage over your competition isn’t as simple changing your light exposure, timing your feeding/fasting cycle, or moving your workouts to a certain part of the day. It also involves layering these factors properly in relation to one another, and with respect to when you’ll be training, practicing, and competing. Even if you’re at one of the extremes in the chronotype continuum, how you approach manipulating your circadian rhythms is highly nuanced. While your approach is guided by your chronotype, you need to know if your chronotype is being dictated more by your genes or by your environment. If you’re a Night Owl only because you’re up partying all night and eating 24/7, your approach would be completely different than if you’re doing everything right and still a Night Owl. It’s also important to understand that your chronotype changes with age, and some of this is biologically driven. As we enter puberty, everyone shifts in to a more Night Owl chronotype and gradually becomes more Lark-like as they pass through middle age in to their twilight years. The fact that the shift to a later chronotype in your teens ends around the same time as adolescence indicates this shift may be critical for the transition from childhood to adulthood. Your chronotype also interacts with when you compete and what type of sport you compete in. A lot of the time your chronotype may self-select you for a sport, where a Lark tends to be drawn to sports that take place in the morning and a Night Owl sports that happen in the evening. But that’s not always the case, and it isn’t as simple as trying to shift Night Owls who compete in morning competitions to a more Lark chronotype. Ultimately, that could cause more problems than it solves. While a lot of factors go in to using your circadian rhythms to optimize athletic performance, there are a few pieces of low-hanging fruit. Once you have your chronotype, it’s important to determine the gene vs environment contribution. A strong driver of the Night Owl chronotype is that Night Owls tend to have a longer free-running clock. This simply means that in the absence of environmental cues, Night Owls will tend to run a circadian cycle greater than 24 hours. This causes them to stay up later and wake up later as well. The simple solution, provide some cues. The first and most obvious cue is light exposure. Exposing your eye to light first thing in the morning and blocking blue light exposure at night are 2 powerful ways to help regulate the sleep/wake cycle. So if you think about it, Night Owls may be more alert at night simply because they’re more prone to the sleep disrupting effects of improper light exposure and not because they’re somehow genetically optimized at night. The next factor is the feeding/fasting cycle. Eating later at night can disrupt circadian rhythms and cause de-synchronization between multiple clocks, particularly for those participating in sports in the early morning. A great rule of thumb is no food within 3 hours of bedtime to start, and you can tweak it from there. Physical activity is also a good environmental cue to manipulate. But it’s important to point out that the responses to training times are highly chronotype specific, with night owls responding differently to activities timed counter to chronotype than larks. With the timing of training, it’s crucial to weight all the factors including chronotype, performance benefits, nutrition, and potential impact on recovery and injury risk. This brings us to what is ultimately one of the most important considerations if you plan on working on circadian rhythms to optimize athletic performance: performance measures. Since your ultimate goal is to improve performance, flying blind with respect to how your efforts are impacting performance is foolish. While the research provides us a starting point, Night Owls aren’t clones of one another. Therefore, how each individual responds to circadian tweaking is likely to be similar but variable. Obviously performance and training load can provide valuable information here, but other tools such as heart rate variability and sleep quality can provide added value and validation that your efforts aren’t going to waste. We are now entering an age in sports where time may be of the essence. Various lines of evidence point to the benefits of using circadian rhythms to optimize sports performance. It’s only a matter of time before athletes and coaches begin implementing circadian variables in to their training programs to maximize factors such as nutrition, recovery, and injury prevention and recovery to elevate their performance. Many factors go in to developing a schedule that will allow athletes to use circadian rhythms to their advantage. The first step is to determine which chronotype they fall under and whether this is primarily due to environmental factors or just genetics. From there, adjusting variables such as light exposure, the feeding/fasting cycle, physical activity, and how you layer the 3 throughout your day can help promote arousal, motivation, nutrition, and recovery to get the most out of your training and performance.